The first annual Colorado Tiny House Festival took place the last weekend of July when 25 different tiny houses (and their builders) gathered at the Wild Animal Sanctuary in Keenesburg, Colorado. 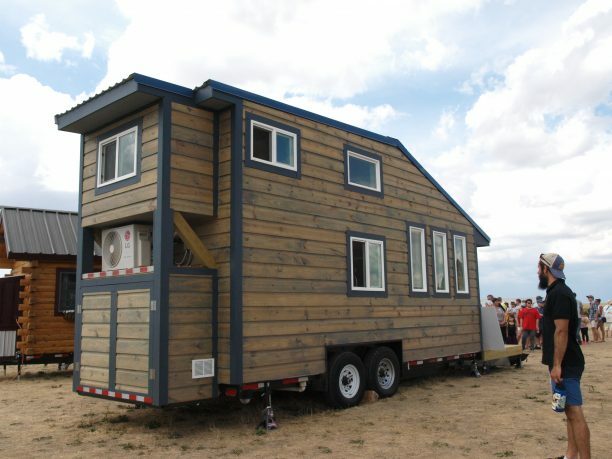 The festival showcased the many ways people are downsizing their square footage and living smaller. The Tiny House Movement has gained a lot of momentum in recent years; this alternative living situation speaks to people across the board—from young millennials who aren’t interested in taking on a mortgage, to older retired couples looking to downsize and be free to travel. In addition to the lifestyle changes the Tiny House Movement is generating, it’s also raising awareness for sustainable building techniques and technologies. Many tiny home builders are putting into practice similar sustainable efforts that we employ on our larger design projects, just at a smaller scale. From the use of reclaimed wood as a building material to energy-efficient appliances and water-saving plumbing fixtures, these little structures provide a perfect opportunity to make sustainable choices and create a healthy home. All the diverse ways people fashioned their tiny homes was fascinating to see. They ranged from DIY projects to professionally-built; some were in the framing phase of construction, and some were complete and fully furnished. Some were there for teaching purposes, some were staged and for sale, and some had food in the fridge and towels hanging in the bathroom. There were a few variations on the tiny house, like a built-out shipping container, a converted school bus, and even a small horse trailer. We left the festival amazed and inspired by all the people who have made this their life. Sustainability, architecture, interior systems, creative planning, innovative materials and artful design come together in the execution of a tiny house, and we couldn’t get enough. Whether you’d like to live in one or not, I believe that we can all learn something from this movement and the principles behind it. We can all do our part to live more sustainably, reduce our footprint and make meaningful choices in the things we surround ourselves with.